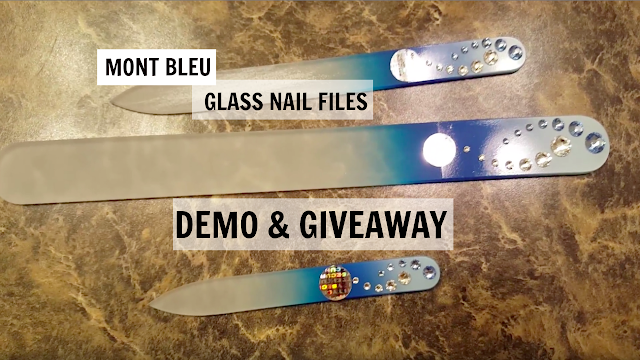 Hypnotic Glamour Beauty Blog: Mont Bleu Glass Nail Files Review + GIVEAWAY! Mont Bleu Glass Nail Files Review + GIVEAWAY! Hey everyone! I've got some awesome news to share with you today. I am having a GIVEAWAY! Mont Bleu was kind enough to send me a second set of nail files to give away to a lucky subscriber. Before we get into the giveaway, let me give you my thoughts on these files. These are a set of high quality nail files. They are quick to file the nail and leave it with a nice smooth edge. They are very gentle and do not tear up the nails at all. Also, they a extremely durable and they are still nice and etched after multiple uses. Check out my YT video for the demo. 1. Must be a subscriber. 2. Under 18 must have parents permission before entering. 3. Must enter through Gleam. Giveaway will run from January 20th, 2016 until February 10th, 2016 @ 11:59 PM. Winner will be announced on February 17th, 2015. You will have 1 week to get me your address to ship your prize. If the winner does not respond within the 1 week time frame, another winner will be picked. Awesome giveaway! These nail files are beautiful!! I nominated you for a Liebster award. Nominate your fellow bloggers when you get a chance!! Awesome! Thanks so much for the nod.